My Sunday Smackdown #9 zendala on a standard 3.5″ square tile made from Fabriano Uno paper. I used Purlbox and Hurry and I’m not sure what exactly to call the third pattern. I kept it pretty simple and clean, using only three patterns, though I’m not quite sure what to call the petal-shaped one as that is really just a technique employed in lot of the patterns. Can anyone help me out on it? I couldn’t resist an artsy shot of my zendala. Inspired by my IG feed I took an artsy shot this time around and I really liked it so I thought I’d share the close-up look at it 🙂 It does really show the detail in how I shaded. 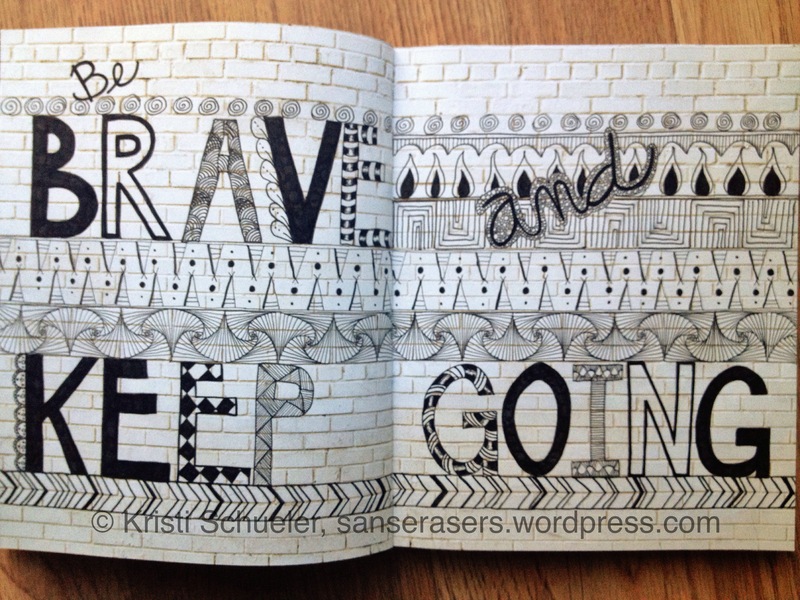 The finished “Be Brave and Keep Going” page in my Wall Notebook featuring a lot of tangles! Then, speaking of procrastination, this has been done for probably a full month I think, but I never took a proper picture of it. The bricks had me employing a bunch of stacking of tangles, though I’m pretty sure it doesn’t quite meet the criteria for the Stack and Tangled FB group. That’s okay though because the same two people have just launch today a Journaled and Tangled group that this will fit in! Sunday Smackdown #9 – Zendala Template Again! Kristi’s Zendala Template for Sunday Smackdown #9. I know, you are all super surprised that I’m issuing a Zendala template Sunday Smackdown. I can’t help it. I love to nerd out with Adobe Illustrator! While I use Illustrator for work frequently, it isn’t often in this type of manner so I still get to learn some new things that no doubt will help my daily work and have some fun and support my hobby at the same time. As usual, I have a 2-page PDF available here. 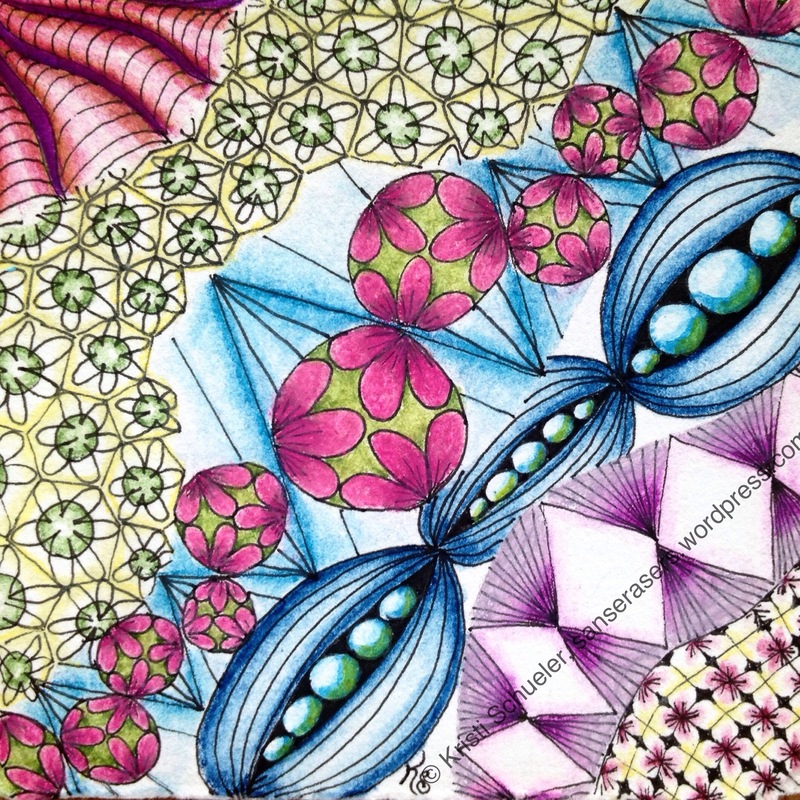 You will find the template sized for standard Zentangle tiles, Zendala tiles and full sheets of printer paper/card stock. On this one I tried to keep it helpful, yet not stiffling. As I created it I had many different ideas pop through my head depending on what lines I left as is and which I ignored and where I maybe added lines. I think that means I achieved my goal. I also have a thought to try use this as a template beneath a round Gelli plate. I’ll post my method for that later in the week if it works as I’m envisioning. When you’ve completed your ZIA and posted it somewhere, please come back here and share a link to it in the comments. We would love to see how you interpret the template. A credit line linking back here for the template so others can play along would be greatly appreciated as well. 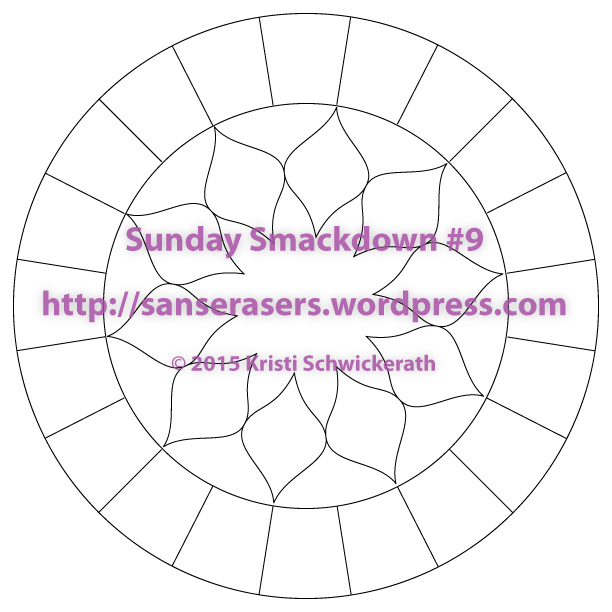 Posted on May 24, 2015 Author Kristi SanseraserCategories Challenges, Strings, Sunday Smackdown, ZendalasTags mandala, strings, sunday smackdown, templates, zendala1 Comment on Sunday Smackdown #9 – Zendala Template Again! 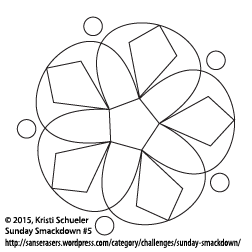 Sunday Smackdown #8 – using at least 4 colors (non-background) in a tangle. From upper left I used Coral Seeds, Oksie (variant), a tangleation of 4MOM and Kuke, Inapod, something I did on my own and something kind of like Buttercup which I then colored in with Prismacolor colored pencils and a ChartPak colorless blender. Well, I finally did it and finally got around to post it — my Sunday Smackdown #8. 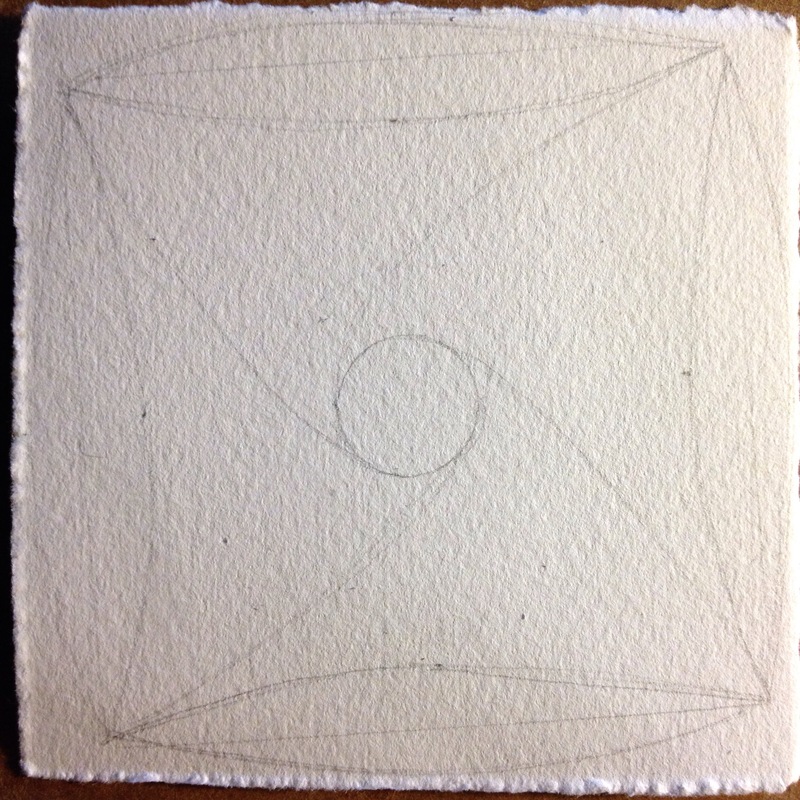 Because I’m obsessed with stacks, I first tangled the patterns in a diagonal stack with the standard micron on one of my DIY Fabriano Uno tiles (still 3.5″ square). Then instead of shading I dusted off my set of Prismacolor pencils and a ChartPak blender (it’s a bit juicier than the Prismacolor colorless blender) and got to work. This was my first time using a solvent blender with colored pencils. I kind of liked it, but will need more practice. I should brush up a bit on color blending to figure out how to do a bit better job at the shading on the spheres. I’m not quite happy with my color distribution. This was most definitely a challenge, Cate! I certainly learned some things along the way. Plus, it was nice to have some color after a solid week of rain as though Colorado had suddenly become part of the Pacific Northwest. Once life settles down I think I’ll be revisiting this technique. For now though, I think I crave the simplicity of black and white or Renaissance. Though maybe if I still had a good set of markers I’d feel differently, but blending the colored pencils takes a lot of time. I’m a little late on the whole Sunday Smackdown thing this week. Actually, I’m so in my head with all the moving stuff I’m not even clear on who should be issuing the challenge or what type it “should” be. But, while I’m the one posting, let’s consider this one to be indirectly issued by Cate, okay? You see, when she picked me up to attend Sue‘s wonderfully generous Illuminated Letters workshop on Saturday (more on that later in the week/month) she had a birthday goodie bag for me. In it were two books meant for journaling and doodling in – The Skywriting Journal and The Walls Notebook. I had first seen glimpses of The Walls Notebook in Alice‘s Instagram feed. When I did some digging to figure out what this mysterious “wall book” was that she kept talking about I ended up at Amazon and noticed there were other themed books as well. 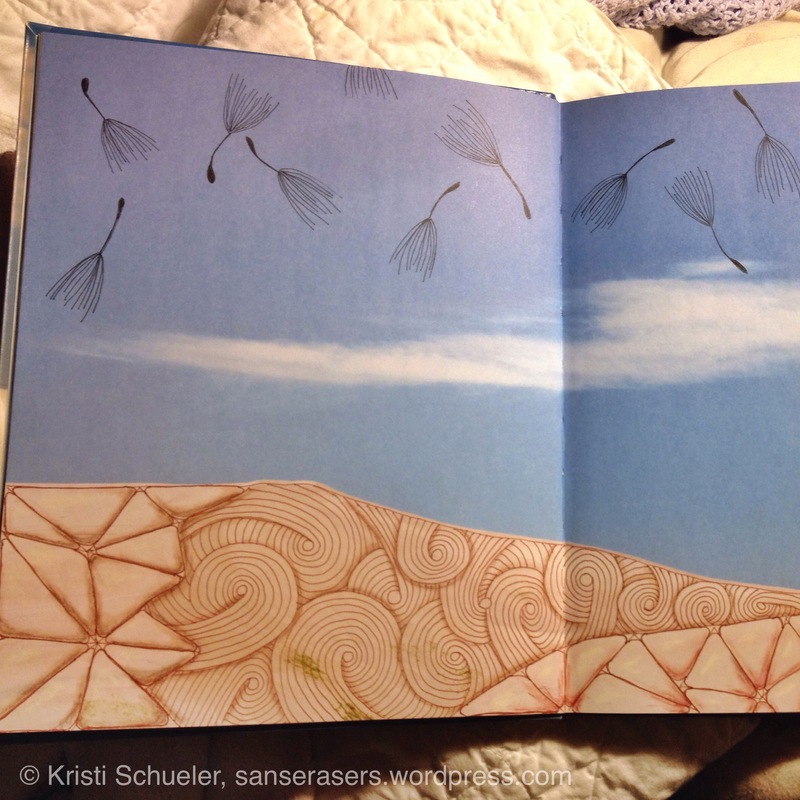 Tangling in my Skywriting Journal from Cate using n’zeppel, sandswirl and flitter. I’m not sure if it is done yet or a WIP. What say you? It was such a surprise to get both books (plus some other miscellaneous goodies)! The workshop was so inspiring plus the lure of new toys and I came home and tangled some more! This time in the Skywriting Journal. I’m procrastinating on working on my letter because I don’t currently have a good place for “quality” tangling. The dining room table is covered in glassware of various types and my desk in yarn and sewing supplies – both for sorting/packing/donating. All of my tangling has been happening in bed, the one room that doesn’t look like it has been hit by a hurricane. 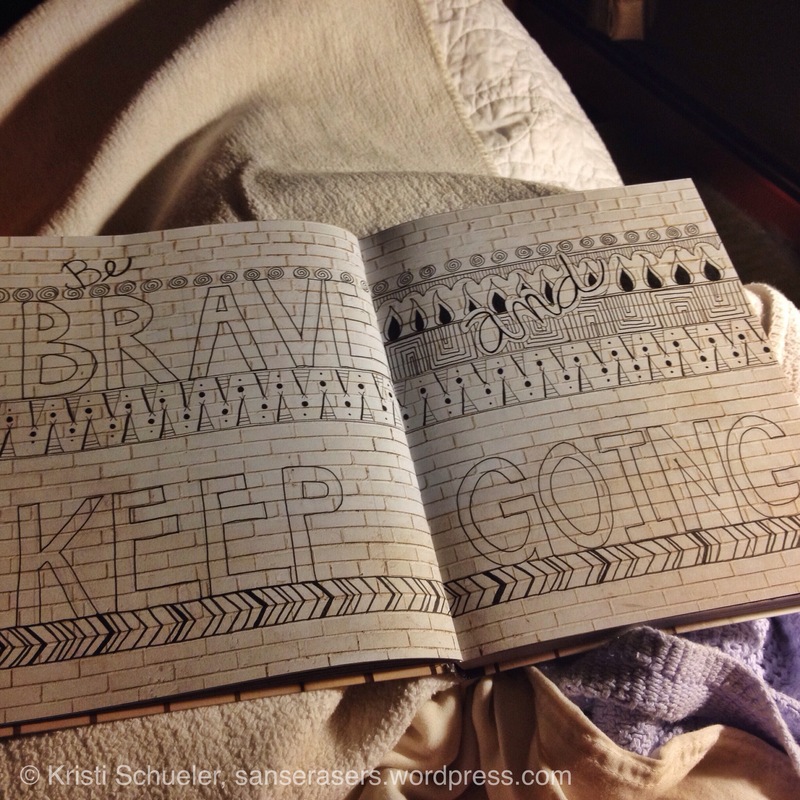 “Be Brave and Keep Going” stacked with printemps, bic, box it up, vectorwec and my own random chevron in my Wall Notebook. This is definitely a work in progress. Not certain what to do with the block letters yet – fill in solid (black or color) or tangle or a combo? Then yesterday I saw that the Stacked and Tangled informal challenge was to use words. Words and stacked tangles seemed natural for the brick walls of The Walls Notebook. My friend, Amanda, gave me a necklace for my birthday that is a perfect mantra for this trip around the sun that is full of new challenges – Be Brave and Keep Going. It seemed like a perfect coming together of elements. It’s a work in progress. The sky one may be as well, I’m not yet sure. One thing is for certain – tangling in books is fun! And I may just end up doing that to some encyclopedia pages as the wonderfully creative and energetic gals at the workshop on Saturday spoke of after I mentioned having a not quite complete set of my grandparent’s encyclopedias and being uncertain whether to move them. So, please join me in the fun and do some book tangling this week! Use a journal like I’ve done or an old book. We’re not strict around here, so feel free to collage a book page onto a tile and then tangle over the page. It doesn’t have to remain in the book. Share your book tangle links in the comments below so we can see what you’ve done! My Sunday Smackdown #6 tile on a 3.5″ square of Fabriano Artistico featuring paradox, tipz and pearls in a pattern as a string. Can you name the string pattern? For those who may be a bit confused about what constitutes a stacked tangle, this one counts because I shaded the patterns so that paradox falls to the back and it looks like tipz and the pearls grouping are vertically layered on top. The lighting is a little poor, but in person I think the stacking pops a bit more. So, can you name what pattern I used for my string? Maybe the photo below will help? My pattern as string – yew-dee! Do you have any tiles you’ve made with a pattern as your string? Please share a link in the comments below! We’d love to see them! Ready for Sunday Smackdown #5? As Cate and few of you know, my day job involves working with the suite of Adobe programs so I’ve itched to make zendala templates almost since I put the pen to Zentangle tile. While my last string challenge, the first Sunday Smackdown, was kind of Zendala-like I didn’t quite feel it was a Zendala. 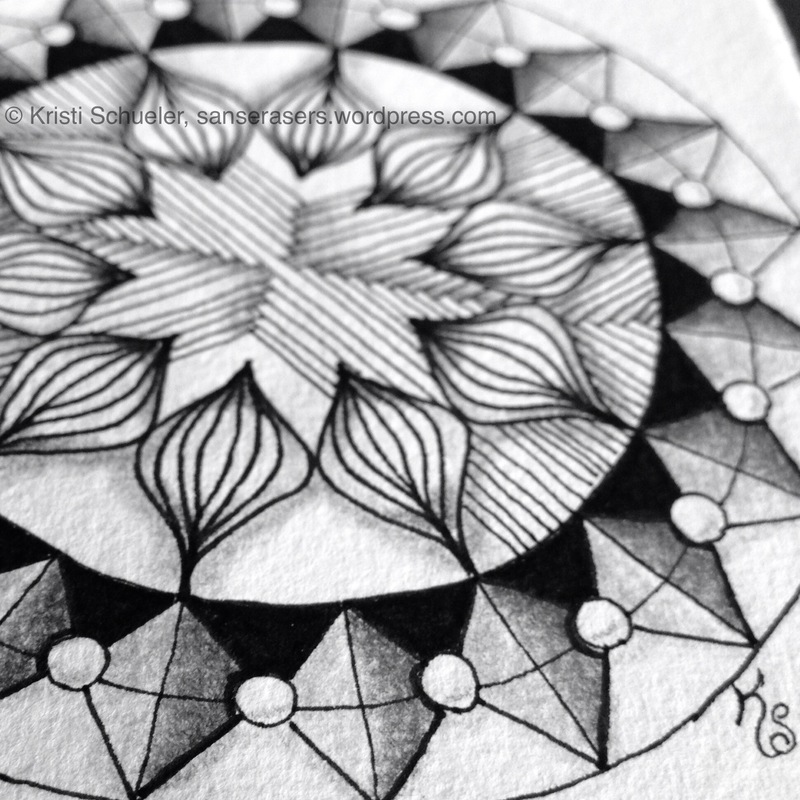 This week’s however is definitely a Zendala or mandala if you just want to color it. There was no real inspiration behind this one. I just started playing with various shapes on my art board in Illustrator and flipped, rotated, duplicated and tweaked path points until I liked what I had. Here is the Zendala or Mandala template for the 5th Sunday Smackdown. The PDF includes full sheet, and the official Zentangle tile and Zendala size. You can download the template file here. In it you will find sizes to fit both the square and round tiles from Zentangle as well as to fit a full sheet of cardstock or paper. Below you can see what I did with it on the first try. 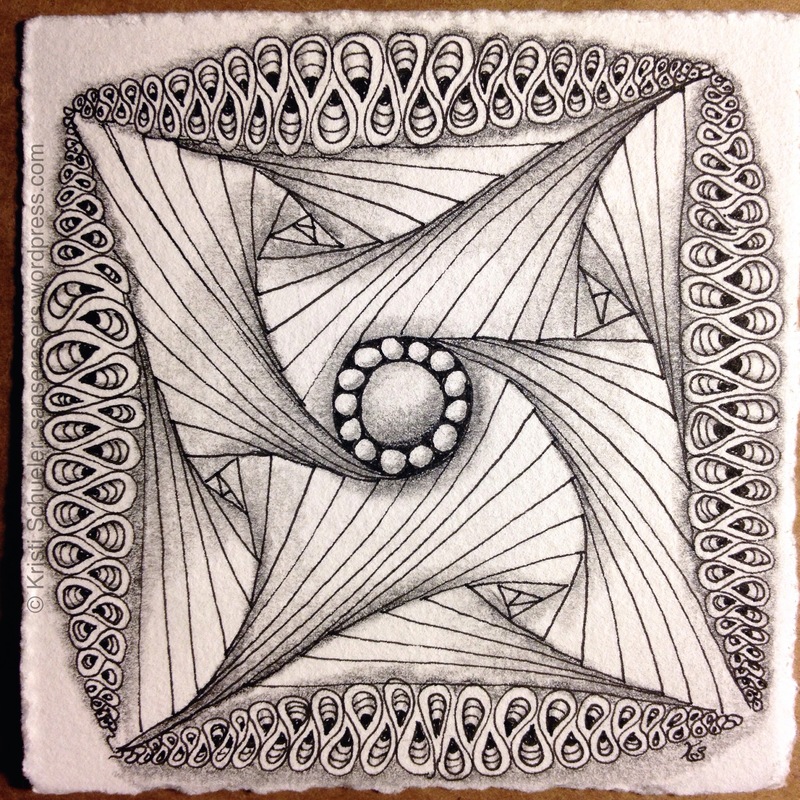 Zentangle Tile 2015-092, a Smackdown Sunday #5 Zendala on Strathmore Toned Gray tile using the chiaroscuro techniques used on the traditional Renaissance tiles. Patterns include pearl, purk, striping, tippe, b’tweed, paradox and tipple. I opted to use a 4″ Strathmore Toned Gray artist tile. The round tile template fits on them, though as you can see I can’t center it on the tile without the outline to guide me 🙂 I have really fallen in love with adding in both highlights and shadows and it even makes my mac ‘n cheese patterns semi-challenging since I have to figure out how to do the highlighting. I’m looking forward to seeing other people’s interpretations of the string. Be sure to post a link in the comments here if you use the template so we can all see! Posted on April 5, 2015 Author Kristi SanseraserCategories Challenges, Strings, Sunday Smackdown, ZendalasTags b'tweed, chiaroscuro, mandala, paradox, pearl, purk, string, striping, sunday smackdown, template, tippe, tipple, toned gray, zendala4 Comments on Ready for Sunday Smackdown #5? Well, Cate, you did good! At first I was a bit frustrated that you had jumped right in with the Neocolors and used overlays with washes. I was pulling my hair out trying to figure out what the heck I could do with my currently limited supplies that was different from that. Then Sue’s mention of her upcomiing gathering with the CO CZTs the day before popped into my head and I knew I had a bunch of unbleached coffee filters in my cupboard and no plan to move them. Plus, we had just finished the Renaissance tile class and I had sepias and browns and white charcoal on the brain. I didn’t want to use the crayons on it though because the of the brown tint (though that could be used as an asset too) and I was wanting to put the Renaissance class skills to use. I also knew I didn’t have any walnut ink on hand to dye them with. Then I remembered up in the cupboard there was also some really, really old flavored coffee beans that never got used and were well past drinkable. And thus my Sunday Smackdown #3 project was born. Step 1: Brew up some strong coffee. Firstly I brewed up some coffee. I’d recommend brewing it at a stronger strength with a bit finer grind than I did. I just winged this step. You could even use left over coffee if you have some. Step 2: Fold some coffee filters in various ways. While the coffee was brewing I folded up a bunch of the coffee filters in different ways. Some I used binder clips on to ensure they held nice folds. My intention was for kind of a dip dye effect so I’d get patterns on the filters according to how they were folded. Step 3: Immerse folded coffee filters in brewed coffee and let sit. The longer the sit the darker the dye. Then I stuck an edge of the folded filters into the coffee and let them sit. I pulled two out rather quickly and they seemed almost undyed. I sprinkled some salt on one and some of the coffee grounds on the other. I didn’t want to let the filters sit too long because I was afraid they’d lose the effect of the folding, but since the first two I pulled seemed unaltered I let the others sit for a couple of days. To dry them I laid them out flat on cookie sheets. You could hasten the drying by putting them in a low oven for 20-30 minutes as long as you keep a close eye on them. Steps 4 & 5: Lay flat to dry. Then steam between two pieces of scrap fabric with a medium iron. Step 6: Tangle! Use the folds or the dye lines or both as your starting string. Once dry I ironed them. I placed a filter inside of an old tee shirt to protect my iron and ironing board. I set the iron to the lowest temp that allowed use of steam which on my iron was the cotton/poly blend. Then I pressed the heck out of them. The folds did not completely disappear. Even the nearly undyed ones have fold lines on them. Using the fold lines like a starting string I put a pen to paper filter and started drawing. This was my first freehand drawn mandala. It was quite the experience. I did a lot of finger measuring to set landmarks for the patterns as I progressed to try keep things somewhat symmetrical. 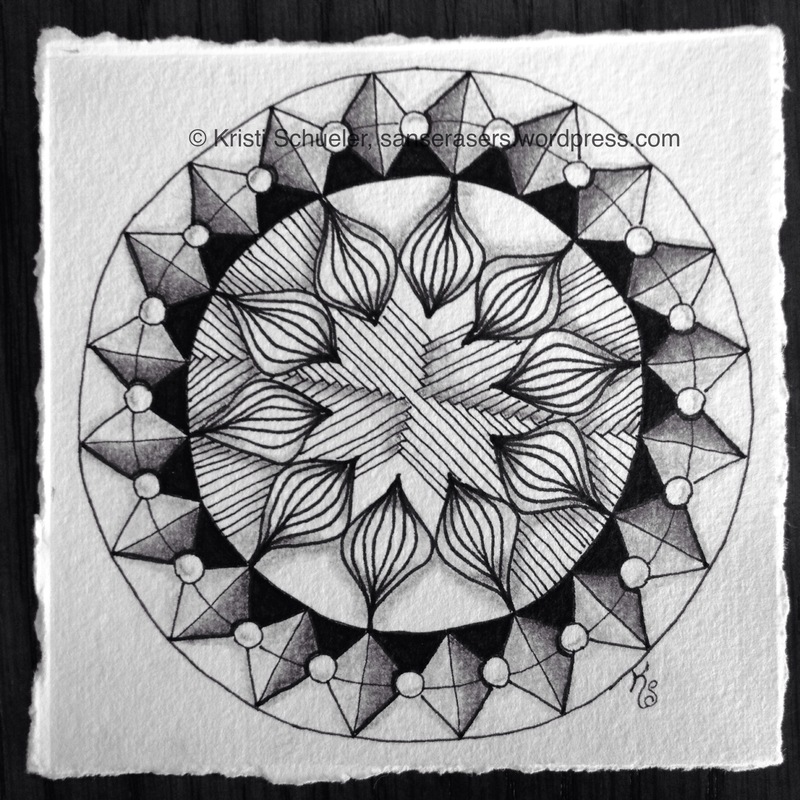 For me the beauty in mandalas is that symmetry. The base filter for this zendala is the one in the upper left corner of the photo of the filters. One thing I noticed was that the more I added to it the less you could see the inconsistencies! They are still there, though I suspect they pop out at me more than anyone else. It does make me think I’d really enjoy using Genevieve’s Dot Mandala Templates. It was really enjoyable to let the shapes appear as I progressed, but my tendency for precision would really like some solid landmarks to work from. In the meantime perhaps I’ll make myself paper dot templates in Illustrator to trace to make sure I’ll use something like that enough to justify shipping costs. The coffee filter is light enough a light box is probably not even required to transfer dots or a string to it. Or perhaps I’ll do an asymmetric tangle on some! I should point out that due to the nature of what a coffee filter is there will be bleed through so be sure to work on top of scrap paper. Also, the ink will bleed and feather a bit. One can use this to your advantage, but it is good to be aware of. You need to keep strokes moving. The slightest pause will cause a thicker spot in your lines. Overall though I really enjoyed working on this piece and am looking forward to working on another of my filters soon. So, anyone else going to join me in tangling on coffee filters? I’d love to see your coffee filter tangling whether dyed with coffee or watercolored or whatnot. Leave a link in the comments if you give it a try!